Target Summer Pops Free Music Festival – A part of Symphony Silicon Valley’s 2012 free outdoor summer music festival, this evening features a lively collection of light classics: highlights from Tchaikovsky’s Swan Lake and Sleeping Beauty, Borodin’s seductive Polovtsian Dances, the hypnotic Ritual Fire Dance, Mozart’s A Little Night Music, Mendelssohn’s Italian Symphony and much more. 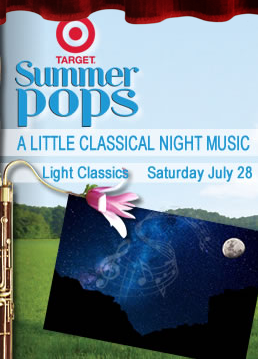 Join the orchestra for an evening of tuneful favorites that will send you home humming. This will be held Saturday, July 28 7:00p at San Jose State University: Campus Green, San Jose, CA.For more information visit their website at Symphony Silicon Valley.